Loppers are the topic this week, and probably the pruning tool category with the largest increase in relatively recent ergonomic options. A lopper is generally called for if you are trying to cut a stem from 3/4” to 2” in diameter. They come in both bypass and anvil blades. They come with short “mini” handle lengths, traditional mid-lengths, long handles and telescoping handles. And they can come with gears or ratchets, and in “heavy duty” size. How do you sort all this out to find what you need? In an earlier post about hand pruners, the most important point we discussed was to ensure the tool fits your own hand. 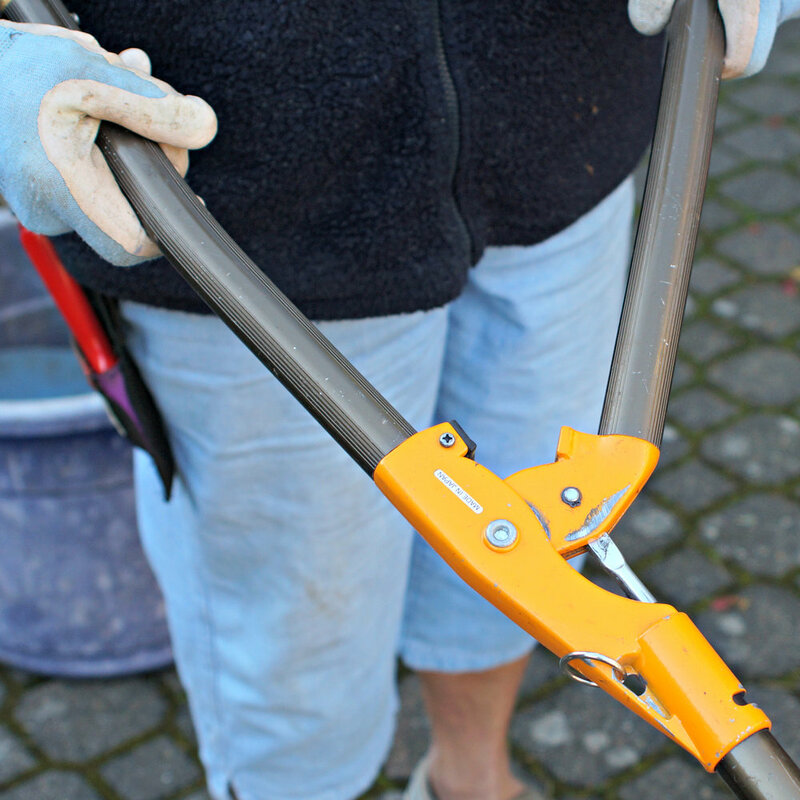 In the case of loppers, the tool needs to work with your own available arm and upper body strength. If you have less muscle-power than an able-bodied male, you probably want to try a lopper on for size at a garden store, or make certain it is returnable by mail. Hold it and walk up and down the store aisles for a few minutes, lifting it in the air a few times, too. Only then will you know if you can hold it through an hour of pruning. Many of the new gear or ratchet models, designed for ease of use, weigh more than my trusty old 2.3 pound wood-handled Corona bypass lopper. A mini-lopper with aluminum handles may weigh less but has a reduced 1-1/4” cutting capacity, so you will have to determine if that tradeoff will work in your garden. I tend to push my loppers to that 2” capacity, and beyond, very frequently. An alternative that I am currently considering for myself is advertised for people with smaller hands, made of aluminum, with ratchet cutting power to a 4” capacity. For about $35, it’s the Gardenite Power Drive 28” Heavy Duty Ratchet Pruning Anvil Hand Lopper, weighing 3 pounds. Because I would be replacing a lighter tool that fits my strength and has never broken, even with hard use, I am still debating. But it is tempting for the increased cutting capacity! Fellow committee member and gardener Jan has a unique Japanese lopper with extended reach, called the Futomaru Long Reach Lopper (pictured at right). She raves about its maneuverability; from standing on the ground, she can reach the top of most shrubs and easily within shrubs to remove dead and crossed branches. 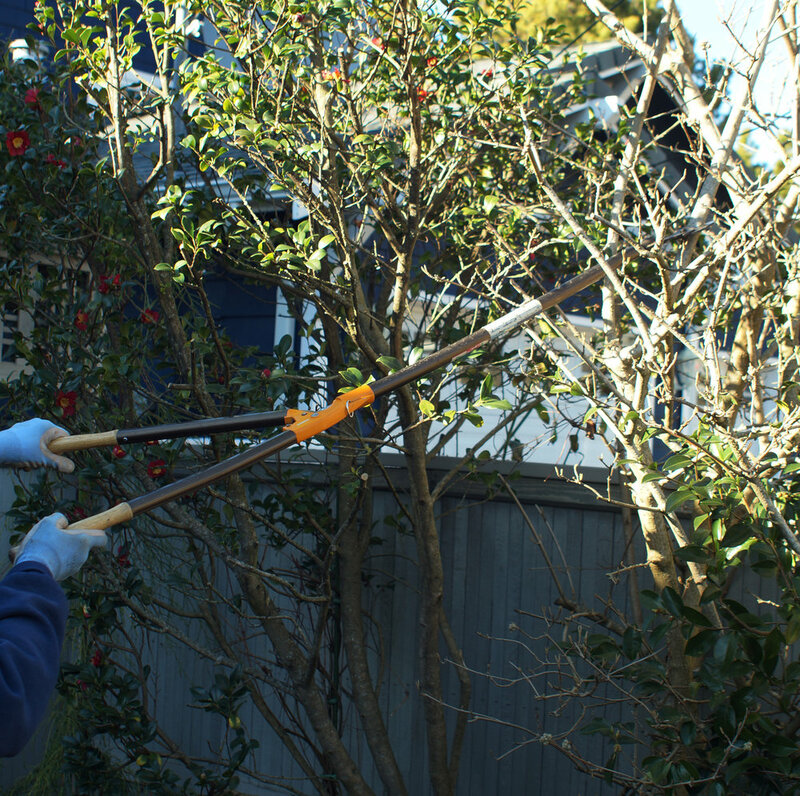 I hope you find these tips handy and will check back in two weeks when I finish the pruner series with a discussion of garden saws. Vivian Mizuta is a native Puget Sounder who grew up with gardening parents. She’s been an occupational therapist and Skagit County master gardener, and loves to try any tool or technique that will make gardening pleasant and easier. She and her husband, along with their Havanese dog Ghilli, have been busy renovating their 1960s garden in West Seattle.